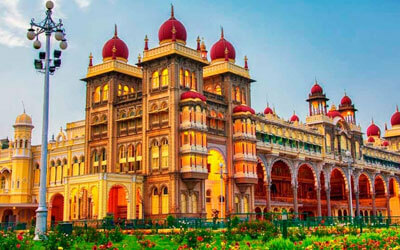 Mysore also called the city of palaces, combines traditional grandeur with modernity and emerges as one of the most beautiful and best planned cities in India. Mysore is not just palaces, parks and temples; the city is also famous for its fragrant jasmine, traditional sandalwood carvings and the rustle of rich silks. Somnathpur Known for the famous 13th century star shaped temple, is the latest and well preserved heritage of Hoysala architecture. Belur also known as the Dakshin Banaras or Southern Banaras, is famous for its exquisite temples especially the temple of Channakeshava, built by the Hoysala King Vishnuvardhana in 1117 A.D. to commemorate his conversion from Jainism to Vaishnavism. Halebid Was known as Dwara samudra, the wealthy capital of the Hoysalas.It has several strikingly beautiful Hoysala temples and Jain shrines. Hampi for the lover of ruins .Hampi looks like a gaint play pen. 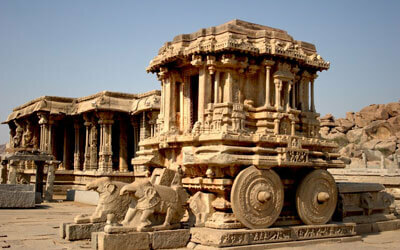 You can still glimpse the splendoue of this once – powerful “city of victory”, Vijayanagar and one of the largest empires in the history of India – in its ruins. It was praised by historians as greater than ROME, with palaces plated with jeweled gold , the ‘ best provided city in the world'. 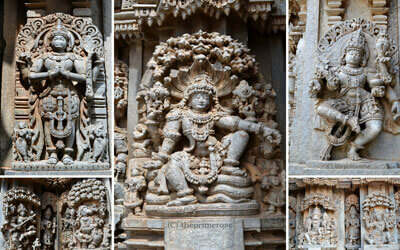 It is a living testimony to the greatness of a bygone era. 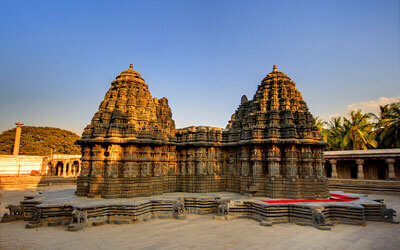 It is an important center on the World Heritage map. 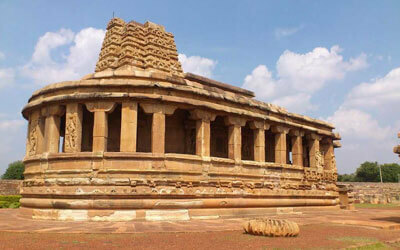 Aihole Famous as the” cradle of Indian architecture”, Aihole has over a hundred temples scattered around the village. 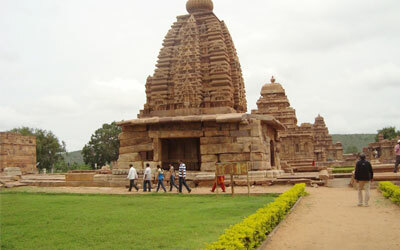 Pattadakal A World Heritage Center – has 10 major temples representing early Chalukyan architecture. Badami Cave temples situated at the mouth of the a ravine between two rocky hills, was the capital of the early Chalukyas. 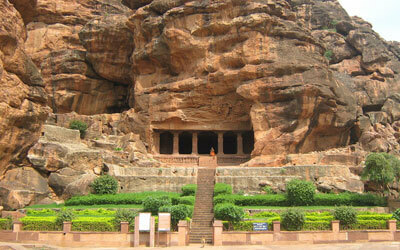 Badami is famous for its four cave temples –all hewn out of sand stone on the precipice of a hill. GOL GUMBAZ The Treasure House of Islamic Architecture .The first thing that comes to mind is the GOL GUMBAZ – the tomb of Mohammed Adil Shah. 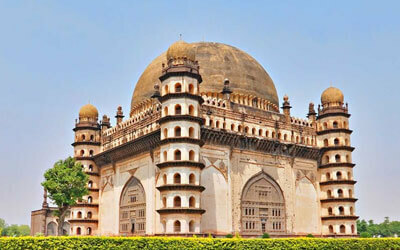 The Gol Gumbaz boasts of the second largest dome in the world. 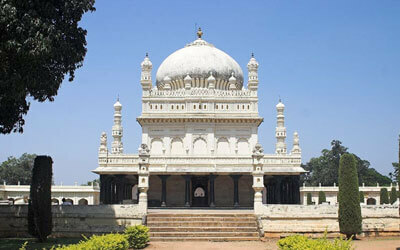 Once the capital of Adil Shahis ,Bijapur was a city that “exceeded anything of its kind in Europe“. Even today, it retains its dignity and royal grandeur. Karwar Gentle waves, palm-laced beaches, silver sands, calm peaceful alleys, soft songs of birds… Karwar has all the makings of a perfect holiday. 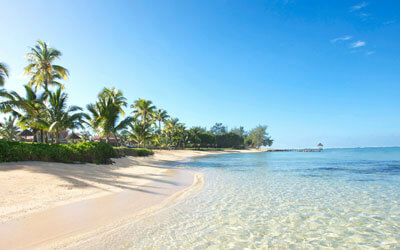 Dev Bagh beach, Malpe, Maravanthe, Murudeshwar and Ullal are some of the more popular beaches of Karnataka.